The Non-Profit Welfare Organization collects young girls that were usually in some sort of event where they would kill themselves, be killed, or were about to die to turn into professional assassins. These girls are “rebuilt” by replacing parts of their bodies with mechanical parts and are then put though a process called “conditioning”. This process has the unfortunate side affect of erasing all of their past memories, which is sometimes a good thing with some of the girls. However, though all these processes, their lifespans are severely shortened and over periods of time they usually experience some amount of additional memory loss. Welfare Organization and what they do. That is the whole storyline. There is not a true ending, there are no overall goals, and in a way, no beginning. This whole series basically amounts to an extremely well done story that may bring a tear to your eye almost every episode. This series is not for everyone, and if you can’t handle the thought of a 10 year old girl with a gun, then do NOT watch this. If you can get past that, then you are in for a very well done anime that will have you thinking about what just happened after every single episode. The graphics were very well done and the shadows were perfect. The graphics fall under some of the best graphics I have seen, but they were definitely way above average. Not much more I can say about the graphics other than to check out the screenshots. 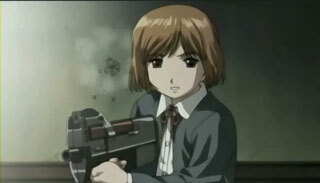 Gunslinger Girl did a lot of interesting things with the music and sound. First off, music was not used nearly as much as in a lot of animes throughout the series, but instead, replaced music with extremely realistic background sounds. A series like this would not give you the same affect if they did overuse music, because the music would distract the viewers too much from the whole point of whatever is going on and reduce the overall dramaticness of the series. However, I’m not saying there is no music. When there is music , it always goes extremely well with the current situation. As for the music itself, it was very good. Finally, there is nothing negative I can say about voice acting, sound affects, etc. other than “absolutely wonderful!”. 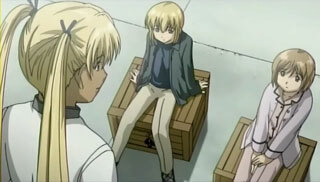 All of the girls’ and their supervisors’ personalities vary greatly, adding many different views to the overall story on what Gunslinger Girl “is” you could say (I should mention, that each of the girls is given a supervisor, which is the only person they will obey fully after conditioning). Some of the supervisors treat their girl as a daughter while some either hide or have no feelings at all for their girl that they are supervising and training. This brings up a couple of very sad events throughout the story since most of the girls literally love their supervisors (some to different extents). Unfortunately, I can’t tell you much more than this or else I would spoil some of the events. 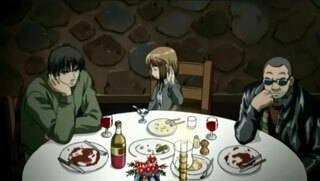 Gunslinger Girl was a very sad series, being nothing like I have ever seen before. I greatly enjoyed it and I think it brought a tear to my eye every once in a while. By the end of the series I was almost literally crying with the way it ended. 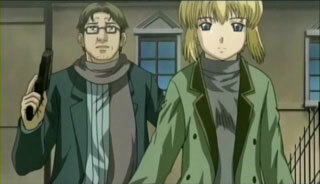 Gunslinger Girl came at just the right length, being 13 episodes, and I highly recommend that everyone watch this anime. CNR is not responsible for or approves of the content in the two above links. About | Contact | Advertising | Suggestions | RSS Feeds | Write For Us! Copyright © 2005 Christopher Beley. All rights reserved.